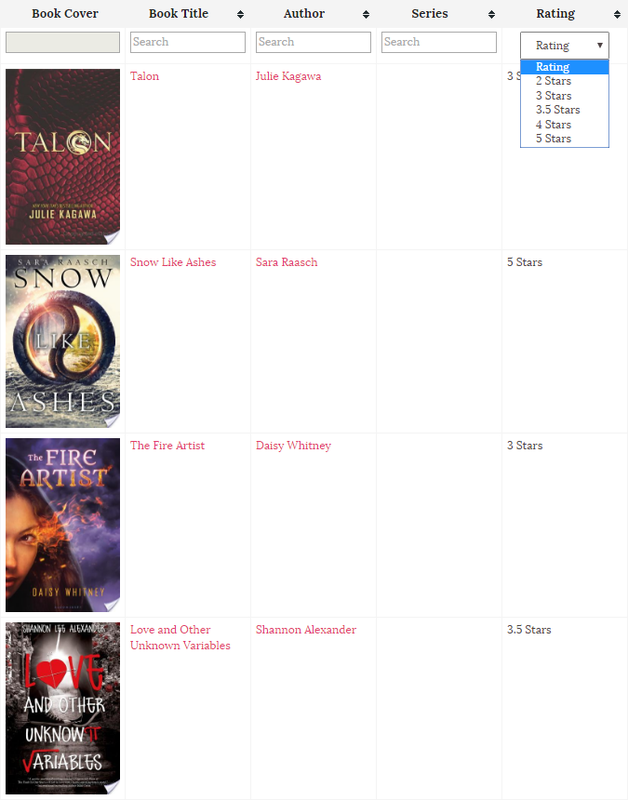 Displays a searchable, sortable table of all your book reviews. You can use the 'columns' attribute to customize which columns get displayed on the page. The columns appear based on which column names you have entered in the 'columns' attribute. They appear in the exact order you enter them. cover – Displays the cover of the book. title – Title of the book. author – Author of the book. series – Name of the series. rating – The star rating you gave the book (in numeric format). reviewer – Name of the WordPress user that reviewed the book. genre – Genre of the book. publisher – Name of the publisher. date – Date the review was published. number – What number book review this was. year – Year the book was published. The columns will then appear in that exact same order. imagewidth – Width (in pixels) for the book cover image.